The vast array of data points that make up “personal information” in the age of online media are nearly impossible to quantify or neatly define. Name, address, and phone number are just the basics in a world where voluntarily posting self-authored content such as text, photos, and video has become a cornerstone of engagement in the era of the participatory Web. The more content we contribute voluntarily to the public or semi-public corners of the Web, the more we are not only findable, but also knowable. Internet users are becoming more aware of their digital footprint; 47% have searched for information about themselves online, up from just 22% five years ago. Unlike footprints left in the sand at the beach, our online data trails often stick around long after the tide has gone out. And as more internet users have become comfortable with the idea of authoring and posting content online, they have also become more aware of the information that remains connected to their name online. Nearly half of all internet users (47%) have searched for information about themselves online, up from just 22%, as reported by the Pew Internet Project in 2002. Younger users (under the age of 50) are more prone to self-searching than those ages 50 and older. Men and women search for information about themselves in equal numbers, but those with higher levels of education and income are considerably more likely to monitor their online identities using a search engine. Few monitor their online presence with great regularity. 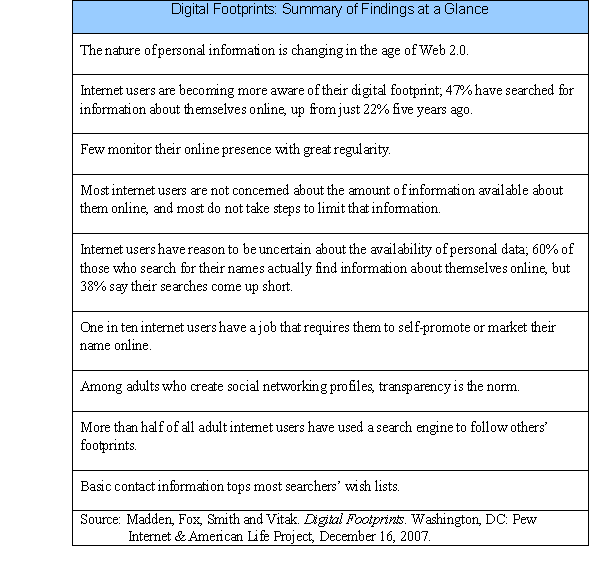 Just 3% of self-searchers report that they make a regular habit of it and 22% say they search using their name “every once in a while.” Three-quarters of self-searchers (74%) have checked up on their digital footprints only once or twice. Roughly one third of internet users say the following pieces of information are available online: their email address, home address, home phone number, or their employer. One quarter to one third of internet users say they do not know if those data points are available online. One quarter of internet users say a photo, names of groups they belong to, or things they have written that have their name on it appear online. Few internet users say their political affiliation, cell phone number, or videos of them appear online. In interviews with the Pew Internet Project, privacy advocates and professional researchers argued that many of these data points are indeed available about most people, either on the open Web or in select online databases. Most internet users are not concerned about the amount of information available about them online, and most do not take steps to limit that information. Fully 60% of internet users say they are not worried about how much information is available about them online. Similarly, the majority of online adults (61%) do not feel compelled to limit the amount of information that can be found about them online. Just 38% say they have taken steps to limit the amount of online information that is available about them. Confident Creatives are the smallest of the four groups, comprising 17% of online adults. They say they do not worry about the availability of their online data, and actively upload content, but still take steps to limit their personal information. The Concerned and Careful fret about the personal information available about them online and take steps to proactively limit their own online data. One in five online adults (21%) fall into this category. Despite being anxious about how much information is available about them, members of the Worried by the Wayside group do not actively limit their online information. This group contains 18% of online adults. The Unfazed and Inactive group is the largest of the four groups—43% of online adults fall into this category. They neither worry about their personal information nor take steps to limit the amount of information that can be found out about them online. Internet users have reason to be uncertain about the availability of personal data; 60% of those who search for their names actually find information about themselves online, but 38% say their searches come up short. The majority of internet users who have the inclination to query their names with a search engine do find some relevant results (60%), but a sizable segment (38%) report that a simple search does not yield any information connected to their name. Among those who have searched for their name online, 62% find that the amount of relevant information about them generally matches their expectations. One in five self-searchers (21%) are surprised by how much information they find online about themselves, while 13% express disbelief at how little information comes up in their results. Fully 87% of self-searchers who locate information connected to their name say that most of what they find is accurate, up significantly from the 74% who reported this five years ago. In contrast, 11% of self searchers who find information about themselves online say that most of it is not accurate, down from 19% five years ago. Just 4% of all online adults say they have had bad experiences because embarrassing or inaccurate information was posted about them online. One in ten internet users have a job that requires them to self-promote or market their name online. While most Americans do not actively manage their online presence, there is a segment of internet users who have jobs that require them to market their name on the internet or make information about themselves available online. As one might expect, those motivated by work-related expectations are much more likely to use a search engine to track their digital footprints. Those with the highest education levels report a greater tendency towards managing their professional presence online. Fully 18% of working college graduates report that their employer expects some form of self-marketing online as part of their job, compared with just 5% of working adults who have a high school diploma. Employees who are required to market themselves online are far more likely to monitor their presence with a search engine. Fully 68% of these “public personae” use a search engine to look up their own name, compared with just 48% of employed internet users who are not required to market themselves online as part of their job. One in five working American adults (20%) says their employer has a special policy about how employees present themselves online—including what can be shared and posted on blogs and other websites. Among adults who create social networking profiles, transparency is the norm. The Pew Internet Project has reported extensively on teenagers’ use of social networking websites, finding that 55% of online teens have created an online profile and that most restrict access to them in some way. Looking at adults, their use of social networking profiles is much lower (just 20%), but those who use the sites appear to do so in a more transparent way. Among adult internet users who maintain an online profile, 82% say that their profile is currently visible compared with 77% of online teens who report this. Among adults who say they have a visible profile, 60% say that profile can be seen by anyone who happens upon it, while 38% say their profile is only accessible to friends. Teens with visible profiles make more conservative choices with respect to visibility; just 40% said their profile was visible to anyone, while 59% reported access that was restricted to friends only. More than half of all adult internet users have used a search engine to follow others’ footprints. When asked about eight different groups of people one might search for online—ranging from family and friends to romantic interests and business colleagues—53% of adult internet users said they had looked for information connected to at least one of these groups. Most are casually curious in their searches for others. Just 7% of those who have searched for information on key people in their lives report doing so on a regular basis. Users are most likely to search for someone they have lost touch with. Fully 36% of adult internet users say they have used a search engine to find information about someone from their past. 19% of adult internet users have searched for information about co-workers, professional colleagues or business competitors. 11% of adult internet users say they have searched online for information about someone they are thinking about hiring or working with. 9% of online adults say they have searched online for information about someone they are dating or in a relationship with. Perhaps due to safety concerns, online women tend to do their dating homework more than online men. Basic contact information tops most searchers’ wish lists. Despite all the new forms of personal information available online, the most popular type of “people search” relates to finding someone’s contact information, like an address or phone number. 72% of people searchers have sought contact information online. 37% of people searchers look to the Web for information about someone’s professional accomplishments or interests. 33% of people searchers have sought out someone’s profile on a social and professional networking site. 31% have searched for someone’s photo. 31% have searched for someone else’s public records, such as real estate transactions, divorce proceedings, bankruptcies, or other legal actions. 28% have searched for someone’s personal background information.